To indicate which aircraft you are flying you must specify three things: the aircraft type, the airline and the livery or special paint job. Both airline and livery are optional. If airline is not specified it means you are flying a non-airline specific aircraft. If livery is not specified it means you are flying the default paint job for the specified airline. To simplify this process, SquawkBox allows you to maintain a list of commonly used aircraft. You then specify which aircraft you want to fly by selecting it from a drop down list. 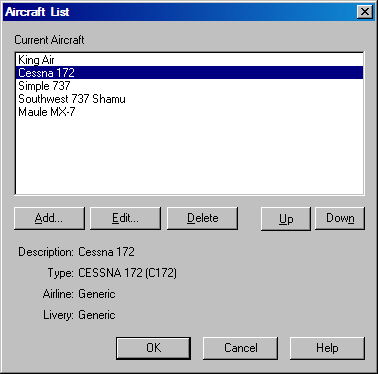 This list is available on the Connect and Change Aircraft dialogs. From those dialogs you can also add, modify or remove aircraft from the list. To do this click on the Aircraft List button. This will bring up the Aircraft List dialog as shown below. To add an aircraft, click the Add button. To modify an existing aircraft in your list, select the aircraft and click the Edit button. To remove an aircraft, select it in your list and click the Delete button. You can change the order the aircraft will appear in your list by selecting an aircraft and clicking the Up and Down buttons. When you click Add or Edit the Aircraft Description dialog will appear. At the top of the dialog you must enter a name for this aircraft. This can be any name you like but should be descriptive since it is what will appear in the drop down control on the Connect and Change Aircraft dialogs. The next section is where you pick the aircraft type. Simply pick your selection from the alphabetical drop down list. Clicking on one of the buttons above the list allows you to display a subset of the list to make it easier to find the plane you are looking for. If you still have difficulty finding the desired aircraft, click the Search button. 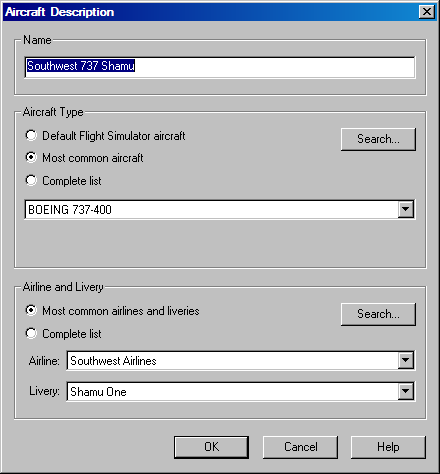 This will bring up a search dialog that allows you to search the entire list of aircraft. Some aircraft types are known by different names. Some aircraft that are equivalent have been manufactured by companies operating under different names. Some aircraft models made by the same company are so similar that they are considered equivalent. If the aircraft you currently have selected is known by other names, you can click the Other Names button to see the entire list. This is for information purposes only. The other section on the Aircraft Description dialog is for Airline and Livery. If the aircraft you are flying is not for a particular airline you can leave the selection as Generic. To select an airline pick it from the drop down list. As with aircraft type, you can use the buttons above the drop down to filter the list or you can search the entire list by clicking the Search button. Once you have chosen an airline you can choose a particular special livery if they are available. Liveries are specialized paint jobs that airlines sometimes use. The items in the aircraft type and airline lists in this dialog are based on ICAO standards. In the online flying world however some operating airlines do not exist in the real world. Some virtual airlines are completely fictional and some are based on airlines that have ceased operation in real life. Every effort has been made to ensure those airlines are also listed. In addition the special liveries used by different airlines are contained in SquawkBox's data files. Maintaining an active list of fictional airlines and liveries is an ongoing effort. As such, if you do not see your airline or livery listed you should send an e-mail to standards@squawkbox.ca to request an update to the SquawkBox data files.